Since 1973, the average family size has gone from a little over 3.0 people down to about 2.55 people – a decrease of 15%. During that same time, the average new home size has increased from 1,650 square feet to 2,650 square feet – a 61% increase! With the average size of our families decreasing, why on earth do we need to buy such large homes? Put quite simply, this trend has nothing to do with needs. Rather, it has everything to do with greed and wants. 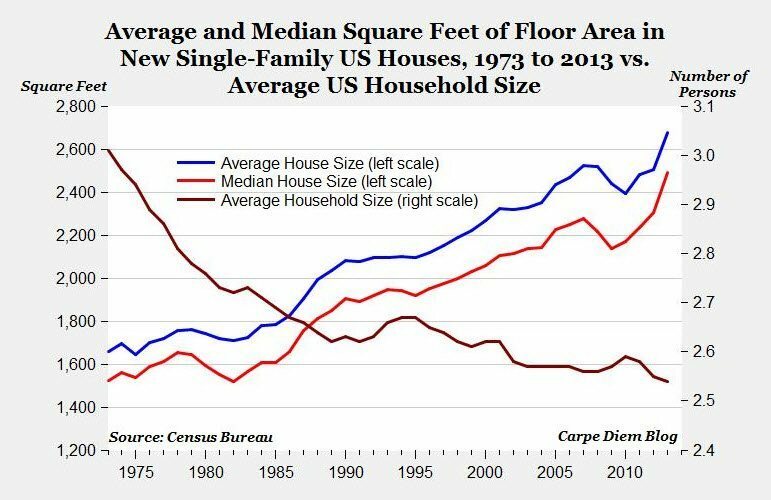 Our nation constantly touts the phrase, “bigger is better”, and when it comes to housing most of us believe it. Larger houses offer a more spacious feel and every activity just seems to be that much nicer because of the additional square footage. There is plenty of counter space for cooking, there are plenty of cupboards for storage, and there is enough empty space for an exercise area! Buying a large home definitely isn’t necessary, but it seems like it should add to our overall happiness, right? Well, let’s take a deeper dive into all the costs of buying a bigger house. Okay, so this one is pretty obvious. When you buy a bigger house, chances are that it’s going to cost you more money than the old one. For many buyers, they simply look at the house as an increase in payment, but it is so much more than that. If you move up from a $200,000 house to a $300,000 house, the payment might only go up by $600 a month, but how much extra are you really spending once all the payments are completed? In this example, that $100,000 increase in house will actually cost you an additional $216,000 (due to the interest expense owed to the bank). Is the bigger house really worth an additional $216,000 to you? It’s certainly something you should think about. Another couple of numbers that very few excited buyers consider is the tax on the property and the cost to insure it. Sticking with the same example of the $200k and the $300k house, your property tax and will likely increase by the ratio of the home value increase. In other words, since you’re jumping up to a house that’s 1.5 times more expensive, plan to spend 1.5 times more in property tax and insurance as well. This could easily add $1,000 to your yearly bill. The summers are still hot and the winters are still cold, but with a larger house, you’ll have to battle each of them a little more heavily. With a larger amount of square footage, plan on spending a lot more money on air conditioning and heat. To get an idea of the costs, be sure to ask your realtor or the current owners of the house you’re interested in. The house is bigger and therefore has more chances for issues. And, not only that, but the fixes are more expensive as well. If you find out that you need an entire new roof, plan on a pretty hefty costs. Do all the windows need replacement? Chances are that there are more windows in the bigger house and therefore the cost will be more. I could really keep going on and on, but for a rule of thumb, many homeowners go by the 1% rule. Each year, plan to spend approximately 1% of your home’s value on repairs. If you move from a $200k house to a $300k house, plan to spend $1,000 more in maintenance. If you’re moving into a bigger home, then you’re probably graduating to a larger yard as well. No longer can you mow with that little push mower and trim the weeds quickly by hand. No sir – with such a large yard, you’ll need to buy a lawn tractor and a gas powered weed trimmer (among many other tools of course). The initial costs of these tools will be thousands of dollars, and the maintenance on them will be greater than you’re used to as well. For some reason, people increase in house size by hundreds of square feet and never consider that they’ll need to buy more furniture to fill all that extra space (duh)! A couch here, a chair there, some extra wall decorations – these things will really add up on you – often to the tune of a few thousand dollars. Finally, since you’ll now have the biggest and best house among your friends, your home is now the go-to for all the parties and gatherings. Sure, it might be nice to host some people here and there, but the costs can really add up when you consider the costs of food, plates, and silverware (and perhaps carpet cleaning). Alright, so the costs of buying the extra square footage are definitely there, but you still might be considering it. Let’s say that over the course of the next 30 years, you spend an additional $300,000 than if you were to keep living in your current house. Do you think it’s worth it? This is quite a large dollar amount, and sometimes it can be difficult to quantify, so let’s put it this way: If instead, you had this money in your retirement, how many years could you live off of it? For many, I’d say they could comfortably live for 10 to 15 years. This is how much of your retirement you are giving up to live in that larger house. Instead of retiring at 55 years old, you’ll have to wait until you’re 70. 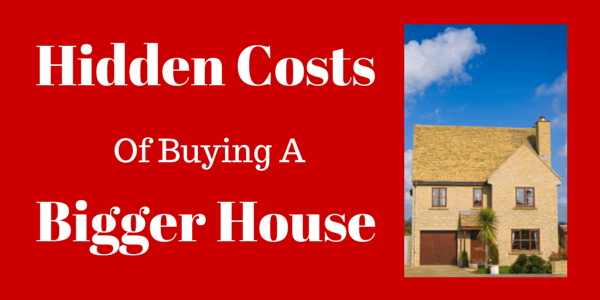 Is the bigger house really worth it to you?